Pub and restaurant chain Mitchells & Butlers has confirmed reports it is considering buying 250 Beefeater and Brewers Fayre outlets from Whitbread. Mitchells & Butlers (M&B) made the announcement as it unveiled a 4.3% rise in quarterly sales, and said it could return up to £500m to investors. 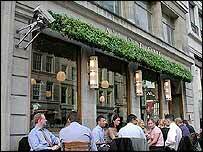 Whitbread said on Tuesday that it was selling the under-performing sites. M&B owns the Harvester and All Bar One chains. Earlier this month it rejected a private equity takeover approach. The £2.7bn offer on 13 April came from the R20 group, led by tycoon Robert Tchenguiz. M&B chief executive Tim Clark said on Friday morning that the planned £500m return of capital to investors could be scaled back if it buys the Whitbread assets, which are valued at £450m. Investment bank Morgan Stanley said that M&B might choose to buy the Beefeater and Brewers Fayre outlets by raising its debts, thereby still allowing it to return between £250m to £300m to shareholders. M&B's like-for-like second quarter sales rose 4.3% in the 13 weeks to 22 April, an increase on the 4% rise seen in the first quarter, it said in a trading update. The company operates more than 2,000 sites and was created when former Bass company Six Continents demerged its hotels and retail divisions in 2002.